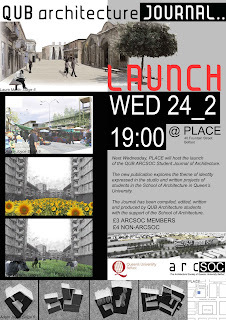 Next Wednesday, PLACE will host the launch of the QUB ARCSOC Student Journal of Architecture. The new publication explores the theme of Identity expressed in the studio and written projects of students in the School of Architecture in Queens University. The Journal has been compiled, edited, written and produced by QUB Architecture students with the support of the School of Architecture. The aim of the journal is to give students a stronger sense of identity within the University and within the wider architectural community; particularly important in providing and strengthening a forum for peer learning, for cross-cultivation and for cross-communication across all years. At present there is a void in this area, with no facility to express and develop this common identity and inter-relationship. The journal will provide a platform with the intention of filling this void and become a fantastic forum, not just through reviewing work but also through its compilation throughout the year. What makes this publication unique is the central underpinning that the journal it is a publication for students by students from the cultivation of studio and written work, to its writing and to its publication. The new journal showcases work from both Undergraduate and Postgraduate students and aims to create a platform within the school for a new dialogue amongst the students and the wider architectural community. Addressing the theme of Identity in the first issue of this journal defines, quite clearly, both it and its purpose. It is the first chapter of what will become a continuing story at Queen’s University, contributing to the architectural students’ lives a compendium of their collective work and aspirations.